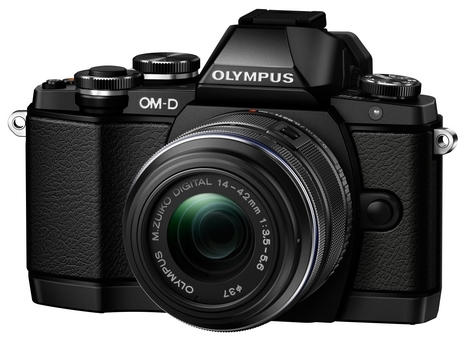 The Olympus OM-D E-M10 is a portable and compact ILC with great performance and image quality. Loaded with useful features and coming in at $700 for the basic kit, this is a fantastic entry-level ILC or travel camera. Read more in our Full Conclusion. At the beginning of 2014, Olympus announced its latest Interchangeable Lens Camera system in the OM-D series. The Micro Four Thirds OM-D E-M10 aims to combine the best elements of the flagship E-M1 and E-M5, and shrink them into a more compact body. The E-M10 boasts a 16-megapixel Live MOS image sensor, the TruePic VII image processor, and an in-body 3-axis image stabilization system (the more expensive OM-D series cameras include a 5-axis system) that "effectively counteracts yaw, roll and pitch with both still shots and HD movies, regardless of the lens attached to the camera." Olympus says the E-M10 internal components should be able to deliver beautiful, high resolution images with exceptional color reproduction that bests other cameras in its class. The E-M10 is also the first OM-D series camera with a built-in flash optimized for 1/250 second synchronization, which will help with daytime flash photography. The E-M10 is a speedy camera, capable of 8 frames-per-second (fps) Continuous Shooting for up to 20 frames in RAW, or with unlimited JPEG frames, assuming you have a memory card that's fast enough. However, if you want to engage Auto Focus, Continuous Shooting drops to 3.5 fps. Users have the option of using the 3.0-inch touchscreen LCD display or the 1.4M dot EVF (Electronic Viewfinder) to frame and compose shots. In addition to acting as a simple view finder, the EVF displays current shooting settings as well as Creative Controls like Live Histogram, Level Gauge, and Live Composite Modes, which previews long exposure shots like light trails and stars in the sky. In addition to Creative Controls, the E-M10 also has Photo & Movie Capture, which lets you shoots stills without stopping HD video recording, 12 Art Filters, Photo Story Mode, which creates a comic book panel of sorts, and 3 HDR (High Dynamic Range) capture modes. The Olympus OM-D E-M10 is available as either a $699.99 body-on configuration, or the $799.99 body + M.ZUIKO DIGITAL 14-42 mm f3.5-5.6 II R kit lens. Color choices include black and silver. See our best price box at the top right of this page to see current pricing online.